Get away from hectic work to diving locations with high quality regulators that make your diving experience even more exciting. The Scubapro MK17 /G260 regulator is an ideal for recreational diving and cave diving. The advantages of using the MK17 Evo is that is performs in all temperate waters. The MK17 Evo features dry ambient pressure chamber for working better in cold water conditions. Regulators can generate extremely low temperature up to -5 °C due to the fast moving air and the pressure drop involved. The MK17 Evo features balanced technology and patented features in quick flow to the second stage. The MK17 Evo has been given a marine grade chrome finish. With a balanced diaphragm the regulator helps in providing smooth breathing mechanisms. It also includes a Thermal Insulating System that protects the regulator from freezing and also comes with four low pressure ports and two high pressure port for easier breathing on demanding dives. The G260 is an adjustable balanced Second Stage which is ideal for cold water excursions. The air balanced flow valve is made from durable corrosion resistant chrome plated brass. The G260 also includes Venturi Initiated Vacuum Assist (VIVA) to prevent free flow in cold water and can be used as an Octopus. The G260 comes with a high comfort orthodontic mouthpiece and a super flow hose for convenient air delivery. The Scubapro MK17 Evo /G260 regulator is loaded with features that make it premium range unit useful for diving expeditions in anywhere globally. It is ideal for professional diver and diving enthusiasts. Air balanced diaphragm The air balanced diaphragm design delivers constant and effortless airflow unaffected by tank pressure, depth and breathing rate. Environmentally sealed - The diaphragm-based MK17 Evo is environmentally sealed so that water cannot enter the inner mechanism. Regulators generate temperatures up to minus 30 degrees due to the pressure drop involved and the fast moving air. It is important that sensitive moving metal parts avoid contact with extremely cold water. The MK17 is environmentally sealed so neither water, nor pollution can damage the inner mechanism by entering it. Two high pressure ports, two low pressure ports and two high-flow ports - These ports maximize air delivery and hose routing options. Air-balanced flow valve - When diving at various depths the G260 air balanced valve provides pressure which gives you smooth inhalation. This feature is useful for those looking for comfortable breathing when diving deep into the ocean. Metal Components - The metal components makes the G260 excellent for cold water resistances. Venturi-initiated Vacuum Assist (VIVA) - This is a control which can be used on the dive or before to enable a high flow exhaust valve which provides comfortable inhale and exhale. This reduces the struggle to breath in certain circumstances. High Flow Exhaust Valve - This is included to reduce exhalation for better overall breathing comfort. Super-flow Hose - This hose features an oversized bore (larger inside hose diameter) that allows more air to flow on each inhalation. Orthodontic Mouthpiece - The ultra-comfortable orthodontic mouthpiece is easy to grip yet doesn’t obstruct airflow. 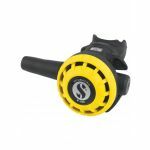 Mouthpiece and Swivel Combined - The hose swivels which gives the diver a better range of motion and give ultimate comfort and reduces jaw fatigue. Reversible Hose Attachment - This allows you to easily adjust hose routing for tech diving configurations. Who is Scubapro MK17/G260 Regulator for? The Scubapro MK17 regulator is for anyone who wants high standard diving equipment. It is a perfect choice for those who like to go on diving holidays and want long lasting future proof equipment. The Scubapro MK17 /G260 regulator is an ideal for recreational diving and cave diving. This regulator is ideal for professional diver and diving enthusiasts and is perfect for divers who want to explore the ocean in cold water conditions.